Last weekend we were able to take a tour of Snow’s Sugarbush, in Mason, during maple syrup season. Snow’s is a family run business that has been going strong for 40 years. 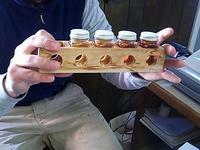 Their maple syrup is a mainstay of the Ann Arbor Farmers Market and our cupboard at home. 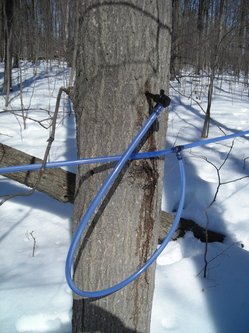 A sugarbush is a grove of trees dominated by the Sugar maple (Acer saccharum - one guess as to which word means sugar). Sugar maples are so named because they have the highest sugar content and thus are the best to tap to make maple syrup. Tapping trees for syrup was a Native American tradition that soon caught on with the settlers. When the spring days hit 45 to 50 degrees and are 20 degrees at night, there is enough temperature fluctuation for the sap to start "running." From my Master Gardener class I know the sap begins to move against gravity because suction is formed by the heat on the stems, creating an evaporation vacuum that pulls up liquid and nutrients from the roots. As long as the temperature keeps shifting the tree will continue to pull liquid up from the roots. That liquid is 97.75 percent water and 2.25 percent sugar. According to Uncle Sam, maple syrup has to contain 66.7 percent sugar. 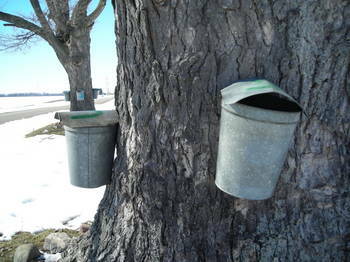 The general rule of thumb is that it takes 40 gallons of sap to make one gallon of syrup. There are several ways to reduce the amount of water - mostly depending on the amount of sap you have. If I were to drill a 2 Â½ inch hole into the sugar maple in my back garden, put a tap in it, a pail under the tap, and a cover to keep the rain out, I could probably collect about 10 gallons over the course of the 6 week season. 10 gallons would boil down to about one quart of finished maple syrup.